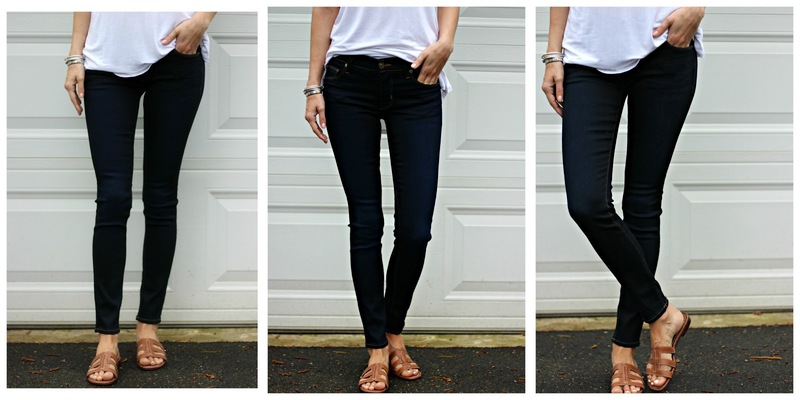 It's no secret that I LOVE my denim - more specifically my jeans! I wear a pair almost everyday & definitely have brands that I favor: DL1961, Citizens of Humanity & my favorites, American Eagle! I usually stick to these brands because finding a pair of jeans that fits perfectly can be so tough. (Even knowing that I love these brands, it's still tough because every pair is cut slightly differently & the washes & distressing are different on every pair.) I was recently approached by LikeAGlove, a new company who is changing the way we shop online for jeans, to try out their new technology to help shoppers find their perfect fitting jeans. The whole process was so amazing - I had to share! A package arrived in the mail with these "smart leggings" & a QR code to download the LikeAGlove app. Once you are set up on the app, slip on your leggings and turn them on by clicking the orange patch. Stand still & press measure in the app. Within 5 seconds, the leggings & app will sync to measure your shape & will transfer the data to the app for you to review! Once your measurements are recorded, a catalog of jeans will be sent to you based on your size recommendations! You can browse by brand or style & jeans are organized based on fit (the closer to 5 stars the pair is, the better the fit!). I do wish that I was able to filter my options by price or by wash since a lot of times, I shop based on price & for jeans, I often pay closer attention to color. But I did like that I was able to see the waist size & inseam right away so I focused on that. Although I fit into 'regular' length inseams, I prefer that my jeans end around ankle length so I opted to focus on inseams that were 28 or 29 rather than 30 or higher. I'm not one to like to admit when I'm wrong (just ask J, LOL) but I have to admit, LikeAGlove nailed it with my sizing. The 25 waist fit perfectly, hit at my ankle and had a ton of stretch so they didn't bag or sag after wearing them for hours. The 24 wasn't awful, but they were a little tighter than I usually like. So bravo, LikeAGlove, I'm a believer in this app! Next up, I think I'm going to try ordering a pair of flare jeans! Interested in learning more about LikeAGlove? Visit their website here. This is such a cool concept! It'd be so useful for me haha I love denim, but finding the perfect fit jeans can be hard. Thanks for sharing, your jeans look great! Me too - I wear jeans almost everyday so having the perfect fit is so important to me! Wow, Michelle---this is such a great idea!! Who doesn't break out in a sweat when they have to go jean shopping?? I think this is brilliant! Isn't it amazing? I was super skeptical but it really worked for me! Great review, the jeans look perfect! Wow! What a crazy, cool idea. I have to try this. With jeans, sizing and fit are crucial. This is such a great service! Yes! I wear my pairs over & over so a perfect fit is a must! Love this service. Totally need to try it out! What a cool service! I would love to try. Thanks for sharing Michelle! How cool is this service?! Thanks for sharing, babe! I need to give it a try!! Sometimes is so hard to find jeans that actually fit everywhere. It sure is! This app is great because it measures all over. No way this is too cool! So crazy that is measures you and suggest things for you. The denim it picked for you looks great! It seemed too good to be true, but it really worked for me! These jeans are perfect! That's such a great concept! WOW! What an amazing app. I have to try it out. Thank you for sharing, Michelle! Shut up!!! This is amazing!! I am so doing this. What a great idea, and such a great post! This is such a cool idea! Awesome that it works too!